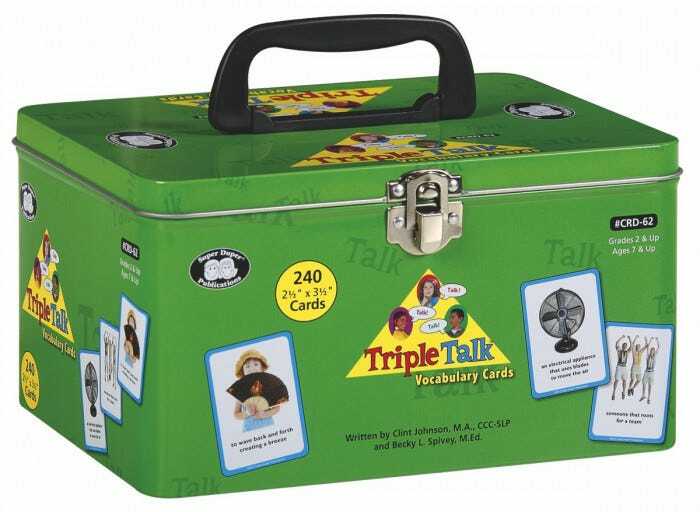 Triple Talk is a fast-paced card game for improving vocabulary, comprehension, and reasoning skills. Presenting students with words that may have different meanings based on their context. For example, you can swim in a pool, play a game of pool, or pool your resources. Each of 60 Word cards has three different corresponding Photo-Definition cards (180 cards). There are three levels of Photo-Definition cards. Level 1 cards have a definition most familiar to students. Levels 2 and 3 gradually increase in difficulty by using the words in contexts that may not be as familiar to students. The definitions present the words as simple nouns, verbs, and adjectives. To play, students listen to/read the Word card and look to see if they have any matching Photo-Definition cards in their hands. A student may be holding one, two, or all three of the Photo-Definition cards. The students play as many matching Photo-Definition cards as they have. The first student to discard all his/her cards is the winner. 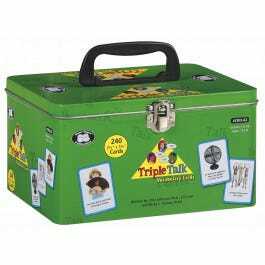 Includes 240 total cards (2-1/2” x 3-1/2”) and instruction booklet with game ideas and activities in a sturdy storage tin. Grade 2 and up.